Visit the MyPLAYER Store to hook your player up with the freshest gears and accessories. 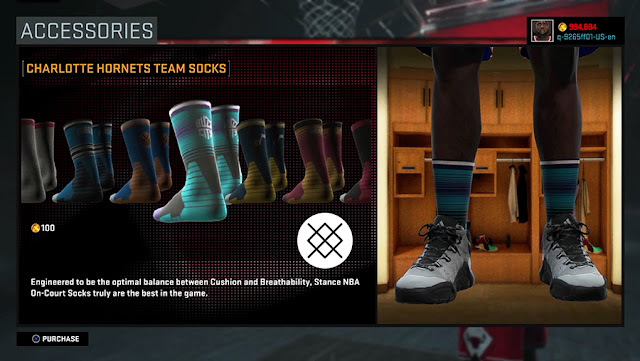 In addition, new items will be added all year long, so there are tons of combinations available to make your character look different from everyone else's on 2K Pro-Am and MyPARK. From jerseys, t-shirts, caps, socks, jeans and sneakers your custom player will be unique. NBA 2K16 is partnering with real life apparel brands, adding a ton of new gear all year long, and creating endless combinations for your MyCAREER player to rep your team, your affiliation and yourself. NBA 2K16 will be releasing this month on September 29th for PlayStation 3 and 4, Xbox One and 360, and Windows PC.